The Ignition Mobile Casino is a good option for players who care a lot about having peace of mind concerning the safety and legitimacy of their playing experience. They are licensed for operation in Kahnawake, a well respected jurisdiction that is pretty strict about their rules, regulations and policies being followed. They are also backed by the same company that backs some of the most popular US-facing brands in the industry. They first opened their doors in the first quarter of 2016, and while they haven’t been around as long as some of the competition, they have definitely developed a good reputation for taking care of the people who play there. Ignition also features a premium online poker room, however this review focuses primarily on their casino offerings. One of the big benefits of playing with this mobile casino is that they make it easy to claim all of their regular promotions. It starts with the 100% match bonus they have for casino players that is worth up to $1,000 on your first deposit. There’s a simple 25x play-through requirement on this offer, and it allows play on most games with the only excluded titles being roulette, craps, sic bo, Baccarat, single-deck and double-deck blackjack. The bonus offer must be claimed when you make your first deposit in order for the deposit to be eligible for receiving the bonus money. Players that use Bitcoin to make their first deposit will be entitled to a 200% match bonus up to $2000 on that first deposit. Just apply bonus code: IGBITCOIN200 and you’ll see the extra bonus cash in your account. The bonus is subject to a 25x wagering requirement and the game of craps does not count towards satisfying the wagering terms. After claiming a welcome bonus offer, players will also be able to get a never-ending 10% cash back reward on all of their future deposits, no matter which other offers they claim. This reload bonus of 10 % added on will apply to all deposits to ensure players are eligible for some free money every time they make a deposit, and it can be combined with any of their other special promotions. This bonus offer is good for the life of your account unless it is eliminated by the casino. Another reload perk is the Weekly Boost program in which players are given a weekly promo code to apply to your reload deposits. The boost awards a 100% match bonus up to $100 on your deposit, and can be claimed up to seven times per week. There are three software companies used to power this mobile casino. The first is Realtime Gaming, and the second is Rival Gaming and the third is BetSoft. Each of these companies have games that work well inside of the web environment that the mobile interface is based on, so you get a balanced selection of different types of titles from each of these companies. It’s a very straightforward thing, and it gives players a lot of different options without having to worry about if the games they are playing are fair. Both of these developers are audited on a regular basis, and they have been proven to have fair, safe and secure games. The interface used with the Ignition Mobile Casino is based on the premise that they want as many players as possible to be able to get in on the action. To this end, they have a very flexible platform that doesn’t require any specific smartphone or tablet. As long as you have a web browser, a touchscreen and an Internet connection, then you’ll have no problem logging in and playing their games. This means that devices using a wide range of operating systems like Android, iOS, Blackberry and Windows Mobile will be able to connect without an issue. When you first log in, you’ll be taken to the games lobby, and from there you can navigate to the type of game you want to play or to manage your account. Games are broken up into genres to make it easy to find exactly what you want, and this intuitive interface makes getting straight into your favorite titles quick and simple. In any mobile casino, the most popular game genre will be slots, and that’s the case here as well. A little over half of the available games on mobile are online slots, and they cover a variety of forms, genres and play styles. You’ll see five-reel video slots along with some three-reel classic slots. On top of that, you’ll find games with tons of different themes, features and graphical styles. There are even slots with big progressive jackpots that could change your entire life inside of a single spin, and that’s something that everyone can get behind. From Rival Gaming, the most important slot titles are their i-Slots, a set of games that have been built around the idea of giving players more replay value than they normally get from other video slots. They’ve achieved this by putting storylines in the games that will take you through several different levels where the features, symbols and payouts change based on what you have achieved in the game. Along with this, Realtime Gaming has their Real Series of slots, a set of games that are tied together by certain themes. They always have at least one (sometimes as many as four) random progressive jackpots that pay out to players at any stakes on any random spin, and they all have great payouts with solid features. 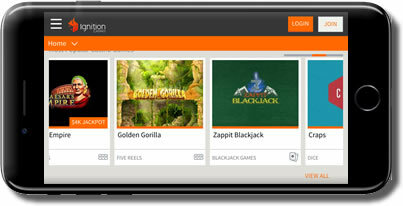 The mobile table game selection at the Ignition Mobile Casino is balanced with a variety of options. Some games are missing that are particularly hard to make work on mobile, like craps, but other than that, they have a great selection. You’ll find roulette, blackjack, video poker, scratch cards, keno and other titles as well. This is particularly good for strategically minded players who really like games that give them a reason to practice and study different strategies and tactics to improve their payout rates overall since there are also plenty of casino poker games that require these types of approaches. Mobile players get two options for contacting their support team. The main option that players will probably want to use is the telephone line because it puts them in contact with a customer service team member right away without any fuss. Your other option is to send off an email using a special email form, and that will typically get a response within a few hours. Their customer service team is available 24/7/365, so it doesn’t matter when you are playing because you’ll always have someone there to give you assistance when you need it. In terms of the cashier section of the mobile casino, you can access everything to manage your account from their mobile app just like you would be able to from a computer. The banking options are credit cards, direct bank transfers and bitcoin for the most part, and they have a great help system for players who want to start using bitcoin that will get you started quickly and without much of a fuss. It’s a great option with a great 25 percent match bonus on every deposit (on top of the 10 percent cashback you always get) that should make you consider it. 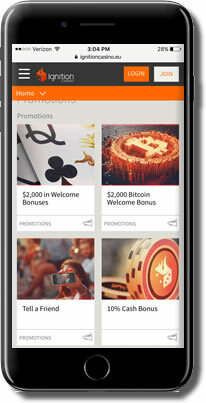 The Ignition Mobile Casino app has a lot about it that will ensure that players have a positive experience overall. From the promotions to the game selection and the easy-to-use interface, there’s not much that players could find to complain about. While they are missing a couple of key table games, this is a minor issue that will affect a small number of players, so we have no trouble recommending this mobile casino app in spite of that issue.